When Christ was crucified, the disciple’s world was shattered and their future uncertain. Where would they go? What would they do? Two of them were on the road to Emmaus, a village near Jerusalem, and as they walked, their conversation was about Jesus and the harrowing events of the previous week. What were they to make of news received from the women who went to Jesus’ tomb and found it empty? The women said angels told them Jesus was alive. While the disciples were walking, the resurrected Jesus joined them on their journey. They were unable to recognize him, however, and when this stranger (Jesus) asked what they had been discussing, they became still. Their heads were downcast. The disciple, Cleopas, asked incredulously, “Are you the only one visiting Jerusalem who does not know the things that have happened…?” When asked, “What things?” Cleopas, recounted the ministry of Jesus the Messiah and how he was sentenced to death and crucified. As the travelers approached the village of Emmaus, it was near evening and the disciples invited the man accompanying them to stay instead of continuing on his journey. Jesus stayed, and when they were ready to eat, he gave thanks for the bread and broke it. As bread was given to the disciples, they were shocked when they realized suddenly the man they met on the road, and now was in their presence, was Jesus. After Jesus revealed himself, he disappeared. As a youth, Rembrandt’s schooling was in Latin and Religion and in addition to his skills in art, he developed a deep interest in the Bible. In his drawings, paintings, and etchings, he returned to biblical themes throughout his life. Rembrandt was still a young man when he painted the Supper at Emmaus, and it is a subject he returned to later. His earlier painting, shown here, depicts the exact moment Christ revealed himself to the two disciples. The light source in a painting establishes highlights, shadows, reflections, and it gives definition to three dimensional forms. Often the light is provided by a candle, lamp, or window, and at times more than one source is included. In addition to natural and artificial sources, light emanating from Jesus has been depicted in paintings since the early Renaissance. 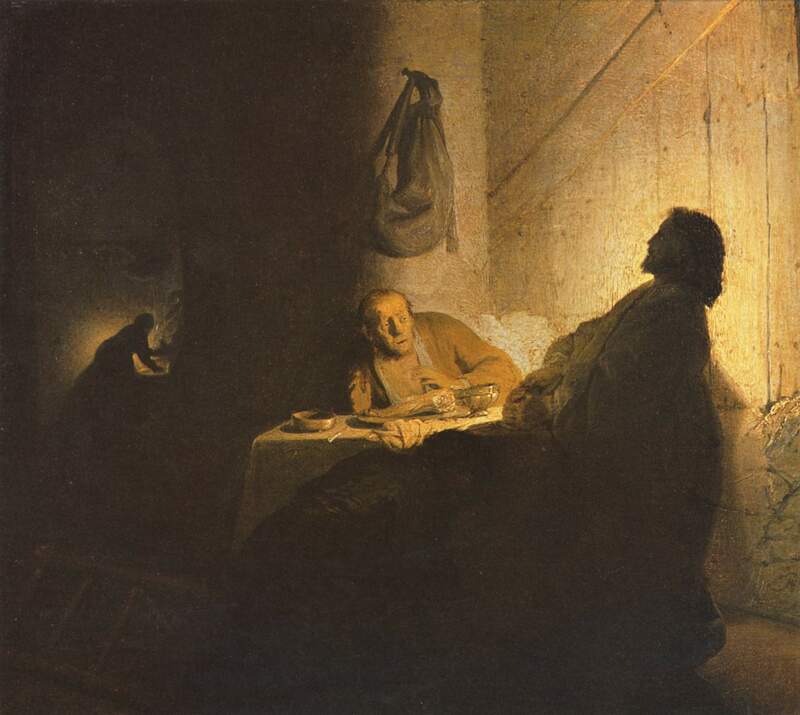 In Rembrandt’s Supper at Emmaus, the primary source of light comes from Jesus and much of the painting is in shadow. In the background is a dim light surrounding a servant who is unaware that Christ has revealed himself to the disciples. Upon realizing they had been walking with Jesus on their journey, and that he was now with them at the table, the two disciples were overcome. One disciple fell to his knees at Jesus’ feet. [He is in deep shadow in the central foreground.] The disciple seated across from Jesus is recoiling in awe and is overwhelmed. Perhaps fright is being experienced as well. Rembrandt made dramatic use of light and dark tones to suggest something extraordinary was taking place. Next Next post: Hail to the Lord’s Anointed, great David’s greater Son!